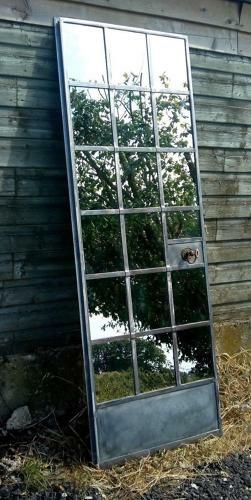 A reclaimed, industrial style, crittall door that has been converted into a mirror. The door has 18 small panels that have been fitted with new mirror glass. There is a rebated edge around the mirror, a brass pull handle and escutcheon, giving great character and highlighting the mirror's previous use as a door. The mirror has a stunning design and would make a wonderful statement piece. The metal has been stripped and lacquered and has a great industrial look. One crittall bar has the makers name "Hopes" stamped into it. The mirror can be hung from the wall or free standing. The item is reclaimed and therefore has some character wear, adding to its industrial look. The metal has some tarnish, pitting and patina and a small number of light patches of surface rust. Please see pictures for details. The door is a very attractive item and crittall is currently very popular. Ideal for an industrial or modern interior, the mirror is of a great quality and has a very interesting look.